This week we talk to Julika von Stackelberg , a parenting educator based in New York working with the Cornell Co-operative Extension about how she discovered the peaceful parenting approach that she now promotes, what it entails, how it has challenged her and the parents she works with and why she thinks that changing our approach to parenting could, in the long run, change the world. Julika von Stackelberg-Addo is a Parenting & Family Life Educator at Cornell Cooperative Extension. 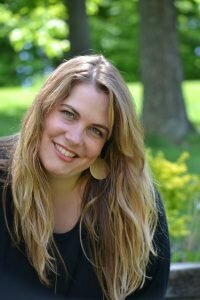 She has an international background and has worked with parents one-on-one, in groups and as a workshop leader, teaching parenting skills and helping families integrate their unique values into their lives. Julika’s background also includes raising funds and awareness to help end violence against women. She lives in New York, USA with her husband and their three children ages 11, 9 and 5. She loves books (mostly audio), binges on podcasts, loves the outdoors and hopes to run a Ragnar Race one day. If you like this episode of Change Making Women please like us on SoundCloud or rate & review us on ITunes or Stitcher– it helps us connect with more change making women and to grow this work. This week Ziada asks Mary Ann about her own personal experience of miscarriage and we talk about how it is one of a number of issues that deeply after women & their partners that we so often simply don’t talk about. This week on the podcast we talk to Lilian Galinoma (Makau), who is a Talent Manager at Tanzanian Breweries (recently taken over by AB InBev) about what it means to pursue a feminist agenda in the workplace and how she has developed a forum for women within the company to support female employees and help the company to engage with the issues that matter to them.